We often need more sleep in fall and winter because our circadian rhythms (sleep-wake cycles) are influenced by light exposure. I find that many people fight this need for more sleep and find themselves feeling more tired in the fall. Each person has a different need for hours of sleep and that need changes throughout the year. If you wake up feeling rested before your alarm goes off and you do not find yourself craving high-calorie foods, you are probably getting enough sleep for your individual body. Some indicators of inadequate sleep include: feeling sleepy while driving, falling asleep immediately after getting into bed, and feeling so tired when your alarm goes off that you press the snooze button. Sleep is necessary for balancing growth hormones, insulin, leptin, and ghrelin but it is also important for general well-being. While my son was a baby, I noticed that sleep deprivation gave me an overall sense of impossibleness along with a lack of motivation to do the things that help me enjoy life like cooking healthy food, engaging in physical activity, and spending time with friends. Inadequate sleep reduces the production of growth hormone. Growth hormone stimulates muscle development which increases metabolism and helps with weight-loss. The release of growth hormone is highest during deep sleep which happens in cycles. With each sleep cycle, the body produces a burst of this metabolism-enhancing, muscle-building hormone. If sleep duration is shorter, there will be fewer bursts of growth hormone production. In the clinic, I notice that when people tell me that they have been working out but not noticing any change in their muscles, it is often because they are not sleeping enough. In fact, when people are doing intensive training for an event or beginning a new workout routine, I recommend increasing sleep duration by an hour per night to support muscle development. 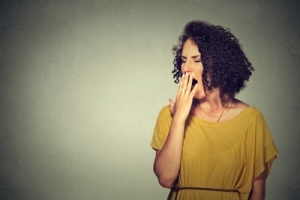 Lack of sleep decreases levels of a hormone called leptin. Leptin governs the feeling of having eaten enough food (satiety). When leptin is decreased, feelings of hunger or appetite are stronger and you must eat more to feel like you had enough to eat. Meanwhile, lack of sleep increases levels of a hormone called ghrelin which causes increased cravings for high-calorie foods. Multiple studies have shown that this change in leptin and ghrelin levels occurs even with one night of inadequate sleep but gets worse with multiple nights of less than seven hours of sleep. This, combined with the tendency to eat more when we are tired in an attempt to get more energy is a bad combination. One study showed that after a single night of sleep deprivation, people ate an average of five hundred extra calories. Normal, healthy volunteers start to show signs of insulin resistance (which contributes to the development of Type 2 Diabetes) after only one night of sleep deprivation. This effect is reversible if the person gets a good night sleep the following night but if the person continues to sleep four to six hours per night, that insulin resistance could progress into pre-diabetes then diabetes. This is compounded by the fact that sleep deprivation causes cravings for sugary, high-calorie foods and consumption of high-calorie foods is also associated with increased risk for diabetes. Thyroid hormone governs metabolic activity which means the rate at which your body burns calories. For a long time, the studies that showed that thyroid hormone was lower in people who did not get adequate sleep was assumed to be a causal relationship. More recent studies call this assumption into question and suggest that thyroid conditions cause difficulty sleeping and therefore we cannot say that lack of sleep causes decreased thyroid hormone production. What we do know about sleep and thyroid function is that lack of sleep changes the production of adrenal hormones cortisol and DHEA which do impact the function of thyroid hormones. I have seen patients’ testosterone levels increase simply from increasing their sleep duration by one hour. This relationship was established in multiple studies. Testosterone production decreases even with short-term sleep deprivation. For these reasons and many others, sleep is essential to maintaining a healthy body weight, preventing blood sugar problems and recovering from daily stressors. Sleep time often feels like inactive time but it is actually fundamental to overall health as well as focus and stamina. People often reduce their sleep time in order to get things done but sleep deprivation has a negative effect on their overall productivity. It’s important to remember that sleep is productive both from a hormonal perspective as well as from a professional and family perspective. At Third Stone Integrative Health Center, we see many people who do not get enough sleep due to work schedules, stress, distractions, or difficulty sleeping. Regardless of what your obstacles to adequate sleep are, we can help by reducing stress hormones and supporting sleep hormones to make it easier for you to fall asleep and stay asleep. Contact us to discuss ways to help you increase the quantity and quality of your sleep.